The bravery and resilience of people with rheumatic heart disease (RHD) should never be underestimated. Kitty is a 12-year-old girl with RHD, but she is also known as an RHD champion. 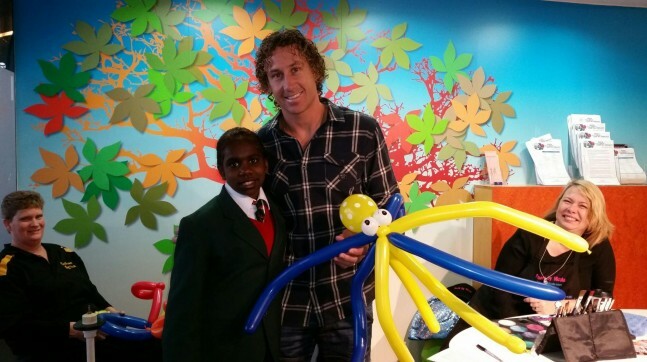 Image: Kitty Fredericks with West Coast Eagles star Matt Priddis. From Kalumburu in Western Australia, Kitty was diagnosed with RHD in January 2015. With no history of acute rheumatic fever (ARF), Kitty was sent to Perth’s Princess Margaret Hospital with heart failure and had to undergo surgery. Princess Margaret Hospital - the Paediatric cardiology referral hospital - is 3,000 kilometres from Kalumburu. So when Kitty was hospitalised, her mother had to make arrangements for the other children she was caring for in order to be with Kitty during her difficult time. Despite being in some pain, Kitty recently spoke on the radio as part of an awareness campaign for the Telethon appeal to raise funds for sick kids. She was subsequently nominated by HeartKids WA as the Telethon Champion, representing the children from remote communities who have to travel such long distances to receive specialist care. The nomination was in recognition of the bravery and resilience of the children and families who have to adapt to health service provision in order to become well.